I think I know why…. Not only are they apparently hard to come by, but I’m pretty sure The GrandPa’s mother collected every single one, and hid them into a prayer book I was given after MY GrandPa passed away. 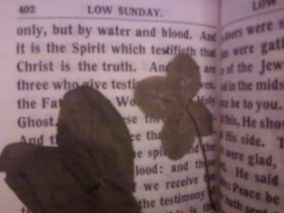 I remember when I opened said prayer book and marveled at the four leaf clovers. So many of them. And family pics stuck in the book. There are seriously SO. MANY. 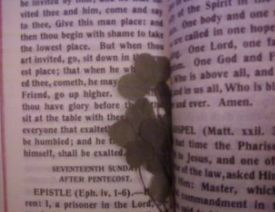 FOUR LEAF CLOVERS. I can’t imagine using the prayer book. Hi, between rock and a hard place…. But I loved that book so much, that I made a super awesome thing to carry it in – this is pre-sewing machine, peeps. That? 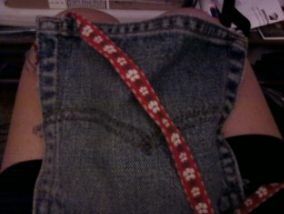 Is a pocket from my favorite jeans from when MY GrandPa passed away. 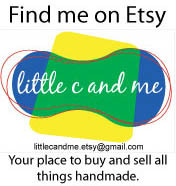 With a little red & white flower ribbon. I did a good job, sans sewing machine. 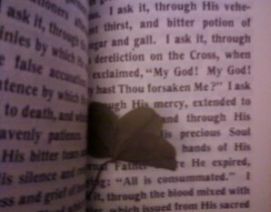 And in case you thought I was joking, more 4-leafers. Would you like more? Cause I seem to have MORE. How is this possible?? And I kid you NOT. There are more. Single ones, between pages. And other multi ones on pages…. How did this woman do it!!???? However, I took it off *just* before the NE diagnosis. So maybe I’ll wear it again. 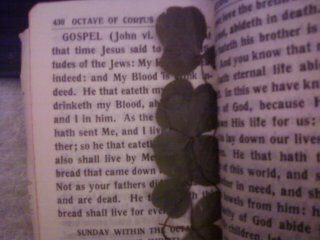 (I’m apparently familial superstitious.) Em, Very. Yes. Also, YES. I’m calling in the BIG GUNS. Yeppers. And going back to my roots. I’m calling on MY GrandPa, MY Nana, MY Granda, and MY Nanny to help out with the awesome Pittsburgh good vibes going to Florida, while I pray at church on Sunday…. And I’ll keep going. Every week. And I’m not planning to quit…. And The GrandPa said it will make things right. And I’ll admit now, The GrandPa, Imma do this. And I know you’re right. I obviously should have listened to MY GrandPa, years ago…. But I didn’t. I’ll make it right. You all know it.